Shlomo Meir Eisenman (Meir) is a licensed Israel Tour Guide who has been guiding and sharing his love of Israel since 2008. He inherited this love of Israel from his grandfather, a 7th generation Jerusalemite and IDF soldier in Israel’s 1948 War of Independence. Meir’s grandfather was a descendant of Yoel Moshe Solomon (from the students of the Vilna Gaon) and a founder of one of the first neighborhoods in “new” Jerusalem outside the Old City walls. He was also a founder of Petach Tikva, one of the first Moshavot (agricultural colonies). 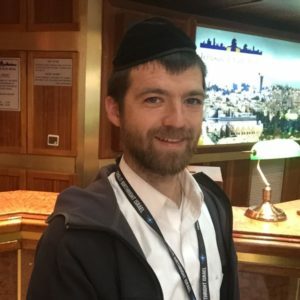 Meir’s childhood years were spent in Passaic NJ however upon completing high school, he followed in the footsteps of his ancestors as he fulfilled his lifelong dream of settling and establishing his family in Israel. Meir currently lives in the old city of Jerusalem with his wife and children. Meir is known for his informative and captivating tours that are enhanced with personal stories and this abundant love for the Land of Israel and its people. As a husband and father, Meir is also equipped with the patience and understanding necessary to create a truly enjoyable family vacation.